Techzim caught up with Zimbabwe’s Minister of ICT, Nelson Chamisa, recently to get some insights into the ongoing e-Learning program rollout that the government has embarked on. In our interview with him, the minister said that the government plans to have e-Learning facilities at at least 1,000 primary and secondary schools in the country by the end of this year. As you may know, the president of the country, Robert Mugabe, and the ICT minster launched the first phase of the deployment of e-Learning facilities at Zimbabwe’s primary and secondary schools last week. “After Tsholotsho we will now be going into the various districts. 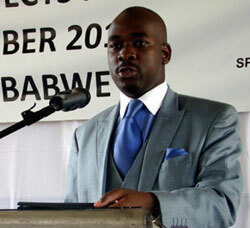 We’re looking at at least a thousand schools before December [this year]” said Chamisa. This is of course quite an ambitious plan but one if delivered would have significant impact on the learners at these schools. The Minister himself is confident they will achieve it. “Our objective is that by 2015 we have gone in to the 8,000 schools in the country” he explained the long term. “We must have connectivity, we must have the hardware, we provide the software and we must have solar platforms where we have no electricity. We are moving from the traditional schools to the modern school. These are amazing things for children. The competitive advantage of children in the country side, in the village, is going to be better or as good as those in New York, those in Beijing or those in Australia”. Asked how they will make sure the program will be sustained after the initial deployment of equipment Chamisa said the government will “superintend the first phase”, and later hand it over to the schools to maintain the facilities themselves as part of their regular costs of running the schools. But he was also quick to say that how this will be handled will be dertemined by some factors not quite clear yet. “It’s going to be built into the schooling system either by government or the school fees system. But the model is going to locate itself appropriately”. We were a bit surprised that part of the plan is to wait for the model to allocate itself. The government is not exactly cash rich at the moment, and hasn’t been for a while. We’re optimistic but don’t know about the future. On the other hand, expecting enough funds for these 8,000 implementations to come from the learners in the form of fees levied on their families is being overly optimistic of the affordability of maintaining these facilities. The project will have to get some more definite funding support going forward. And if the government cannot afford, and the families of the learners cannot, we will unfortunately have to bring out the begging bowl and go international. Maybe that’s what he meant. The National e-Learning Programme was first launched by the president of Zimbabwe in Goromonzi at Chogugudza Primary school. “The government is not exactly cash rich at the moment”, eh not quite, fact is the government is simply flat broke, and I don’t ever remember a time they were ‘cash rich’. That aside; tossing internet connectivity, some second-hand computers here-and-there and solar panels as well, does that really amount to a credible e-learning strategy that actually yields results and catapult the country into the digital economy? Have school curricula changed to mirror this strategy, not to mention skilling teachers to actually be able to teach students IT skills. Fact is the efforts being being made by the ministry are severely constrained by budgetary resources and students who actually learn IT are those with tech resources at home. But I couldn’t resist commenting on this one though, “The competitive advantage of children in the country side, in the village, is going to be better or as good as those in New York, those in Beijing or those in Australia”, yeah right! Our esteemed minister is best advised to take a page on e-learning from these places before making statements that only make him look daft. ……as we aproach election time, big numbers and big ideas will be flying non stop. Hmm, there’s some information I would have expected you guys in particular to be asking. WHAT ARE THE HARDWARE SPECS (because who doesn’t want to know what our taxes are being spent on?) and what subject does the ICT curriculum comprise? Assuming there is one, and while we’re at it , just who is responsible for setting it?